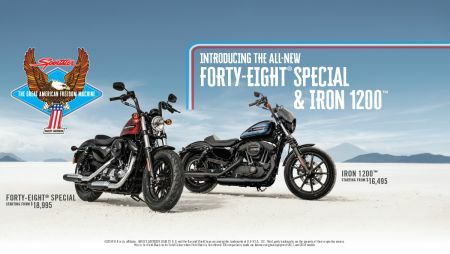 SYDNEY, AUSTRALIA (22nd February 2018) Harley-Davidson adds to the long legacy of its Sportster motorcycle line with the introduction of the Iron 1200™ and Forty-Eight® Special models. The latest in a line of 100 high-impact motorcycles the company plans to introduce by 2027, these new high-bar Sportsters combine throw-back styling trends from the custom-bike scene with the solid foundation of the Sportster platform and the punchy performance of the Evolution 1200 V-Twin engine. "Since its inception, the Sportster has offered the perfect combination of size, power and character that makes it appealing to so many different riders," said Brad Richards, Harley-Davidson V.P. of Styling & Design. "A Sportster is a relatively easy bike to strip down and reinvent. What we've done to create the new Iron 1200 and Forty-Eight Special is what Sportster owners have been doing with their own bikes for generations." "The art on these two fuel tanks reflect contemporary trends we are seeing on custom bikes and in design in general, a move away from more complex and intricate art to a look that's very simple and clean," said Richards. "It's also important to note that these graphics respect the shape of the fuel tank and in the case of the Sportster, that tank shape is a classic design element in its own right." "We specifically selected the Tallboy bar for its shape," said Richards. "It offers less pull-back than the Mini-Ape, a look that really works with the steamroller front end and the smaller fuel tank on the Forty-Eight Special model." That 2.2-gallon "peanut" Sportster fuel tank features rows of bold, horizontal stripes framing a simple Harley-Davidson text logo. The fuel tank is available in three colour options: Vivid Black, Wicked Red, and Billiard White. Adam Wright, Spokesperson for Harley-Davidson ANZ commented, "We are extremely excited to welcome the new Sportsters into the Harley-Davidson fold for 2018. Evolved over 60 years, the Sportster has been crafted with the Australian and New Zealand motorcyclist in mind. Entering its seventh decade, the Sportster appeal is still strengthening."